Simply Create Too Challenge Blog: MID-POST CH. #87 - MASCULINE & FAVORITES FROM CH #86! We are a monthly challenge blog where any type of project from anywhere is welcome! So come play along!! MID-POST CH. #87 - MASCULINE & FAVORITES FROM CH #86! This is the half-way point for our current Challenge #87-"MASCULINE"- there is still plenty of time to get your beautiful entries posted below so stop on by and join in! Congrats & please take our winners badges for your blogs! Fabulous projects by all the DT! 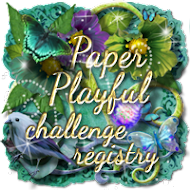 We are listed at Paper Playful! I am a married mom of 2 boys. I am a crafter, scrapbooker, & more! I sell on Amazon Handmade, Zibbet, Etsy, & Artfire online.